A new computer modeling study by researchers at the National Center for Atmospheric Research and the University of Colorado shows how the movement of wind as described in the book of Exodus could have parted the waters. “The simulations match fairly closely with the account in Exodus,” says Carl Drews of NCAR, the lead author. “The parting of the waters can be understood through fluid dynamics. The wind moves the water in a way that’s in accordance with physical laws, creating a safe passage with water on two sides and then abruptly allowing the water to rush back in.” The study is part of a larger research project by Drews into the impacts of winds on water depths, including the extent to which Pacific Ocean typhoons can drive storm surges. “He rebukèd the Red Sea, and the waters drièd up” (Ps. 106.9). So we sang. 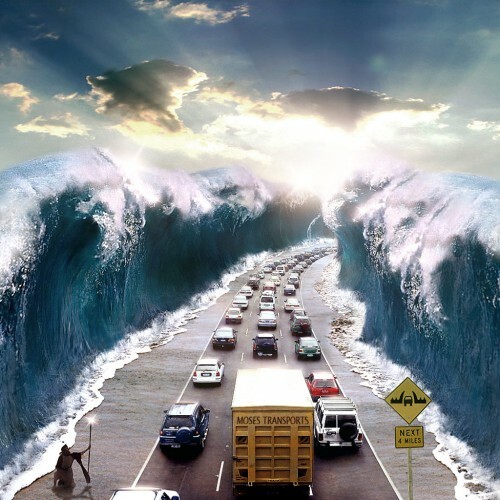 The Exodus account describes Moses and the fleeing Israelites trapped between the Pharaoh’s advancing chariots and a body of water that has been variously translated as the Red Sea or the Sea of Reeds. In a divine miracle, the account continues, a mighty east wind blows all night, splitting the waters and leaving a passage of dry land with walls of water on both sides. The Israelites are able to flee to the other shore. But when the Pharaoh’s army attempts to pursue them in the morning, the waters rush back and drown the soldiers. The researchers found that a wind of 63 miles an hour, lasting for 12 hours, would have pushed back waters estimated to be six feet deep. This would have exposed mud flats for four hours, creating a dry passage about 2 to 2.5 miles long and 3 miles wide. The water would be pushed back into both the lake and the channel of the river, creating barriers of water on both sides of newly exposed mud flats. As soon as the winds stopped, the waters would come rushing back, much like a tidal bore. Anyone still on the mud flats would be at risk of drowning. But who made the wind blow just when the children of Israel needed it? In his novel reworking the gospel, Philip Pullman had the good grace to emblazon the back with the words, in block capitals, “THIS IS A STORY.” In that spirit, the unravelling of biblical mysteries through the device of two twins, Christ and Jesus, provides food for thought for atheists and thinking believers alike. The US National Centre for Atmospheric Research and the University of Colorado have not shown the same tact in breaking Moses’s spell. Perhaps they were trying to help out the law-giver of the Jews when they devised wizardly models to prove that a 63mph wind could have combined with local topography to allow him to part the Red Sea. But why replace a miracle that has captured Christian, Muslim and Rastafarian imaginations with a tale of fluid dynamics? If the aim is to put the whole Moses tale on a scientific footing, it is a doomed enterprise-unless, that is, you can also explain manna from heaven, plagues summoned to order, and instant messaging with the Almighty himself. He was brutal with the golden calf worshippers, and we may take it as read he would take a hard line with the intellectual imperialism of those who pray at the altar of scientific reductionism. Having beaten the odds to survive in the first Moses basket, he spent the next 120 years (of course, people lived much longer in those days) being righteously ruthless with foes and with friends who went awry. Would-be buddies who picked every nit in his many and marvellous stories could expect very tough treatment indeed. This study analyzes the hydrodynamic mechanism proposed by earlier studies, focusing on the time needed to reach a steady-state solution. In addition, the authors investigate a site in the eastern Nile delta, where the ancient Pelusiac branch of the Nile once flowed into a coastal lagoon then known as the Lake of Tanis. We conduct a satellite and modeling survey to analyze this location, using geological evidence of the ancient bathymetry and a historical description of a strong wind event in 1882. A suite of model experiments are performed to demonstrate a new hydrodynamic mechanism that can cause an angular body of water to divide under wind stress, and to test the behavior of our study location and reconstructed topography. Under a uniform 28 m/s easterly wind forcing in the reconstructed model basin, the ocean model produces an area of exposed mud flats where the river mouth opens into the lake. This land bridge is 3-4 km long and 5 km wide, and it remains open for 4 hours. Model results indicate that navigation in shallow-water harbors can be significantly curtailed by wind setdown when strong winds blow offshore.